Seated group observes Myles Horton making notes. 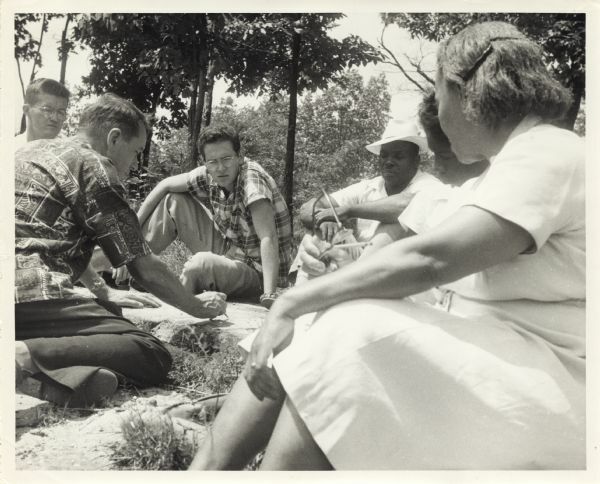 Records of an adult education center and its predecessor, the Highlander Folk School, documenting its labor, civil rights, and Appalachian poverty programs and workshops and the harassment of the Highlander by government agencies. Files include correspondence, minutes, annual reports, financial records, workshop materials, legal papers, play scripts, song books, clippings, speeches, writings, publications, and tape recordings. Intended as a workers' education school and community center, the Highlander Folk School was founded in 1932 near Monteagle, Tennessee, by Myles Horton and Don West.